Remi was driving an SUV with a mileage of 8 kmpl* and decided to change the SUV to one giving a mileage of 10 kmpl (or imagine adding a converter that would now give higher mileage). Sandy was driving a sedan giving a mileage of 20 kmpl and decided to change to a hybrid giving a mileage of 30 kmpl. 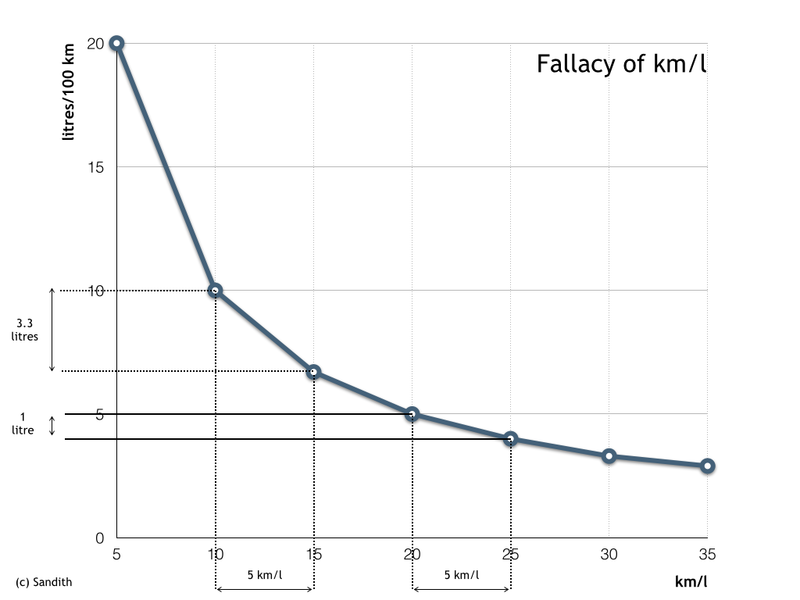 Assuming that both drive about 20,000 km per year, who do you think saved more fuel and lowered emission. Most of you would have thought that Sandy would have saved more fuel in this process. It seems that an improvement of mileage by 25% (by 2 kmpl for a initial condition of 8 kmpl) is lower than 50% (by 10 kmpl for an initial condition of 20 kmpl). In reality it is Remi who has saved more fuel by this transformation. Lets do the maths. For Remi, to travel 20,000 km in a year, she consumed 2500 litres at 8 kmpl and in the better mileage condition consumes 2000 lires- a savings of 500 litres. For Sandy, to travel the same distance, he consumes 1000 litres at 20 kmpl and in higher mileage condition consumes 667 litres – savings of 333 litres. We can now see who saved more. Remi was driving an SUV with a mileage of 12.5 l/100km* and decided to change the SUV to one giving a mileage of 10 l/100km (or imagine adding a converter that would now give higher mileage). Sandy was driving a sedan giving a mileage of 5 l/100km and decided to change to a hybrid giving a mileage of 3.3 l/100km. Remi clearly saves 2.5 l/100km and Sandy merely 1.7 l/100km in the switch.